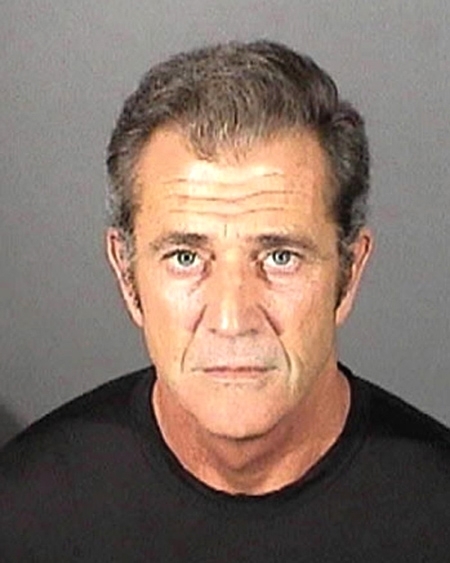 Mel Gibson posed for the above El Segundo Police Department mug shot in March 2011 following a misdemeanor battery conviction. The Hollywood star pleaded no contest to the charge that resulted from a fight with his former girlfriend, Oksana Grigorieva. Gibson, 55, was sentenced to three years probation and ordered to complete a one-year domestic-violence counseling program as well as undergo mental health counseling. Submitted by Paladin59 on Fri, 2011-05-27 18:32. Another case of one person thinking he is above all others. that hard to do when your five foot two. Submitted by heartlessbastard on Tue, 2011-04-26 15:48. Shoulda went to jacuzzi. I hear it's nice. Submitted by MikeNC on Tue, 2011-04-19 22:56. Submitted by Jack Black on Wed, 2011-03-23 17:54. You´re either in Mels Korner or you´re with the Je............. Oh wait wrong person.